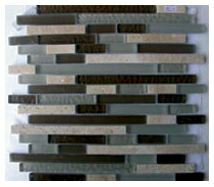 Give your home a glamorous makeover with the Glass Mosaica Olive Green Marble Mix mosaic tile. It features an amazing design that consists of multiple stripes of black, grey and brown glass mosaics. The Glass Mosaica Olive Green Marble Mix tile is available in a standard size of 303x303mm and is sold per piece. 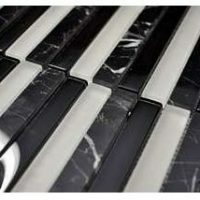 It is an indoor wall tile which is ideal for use in kitchen splashbacks, bathroom walls and in feature walls. 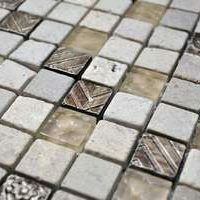 This mosaic offers an excellent blend of style and practicality. 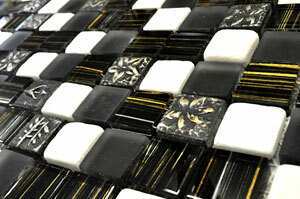 Its great looks with alternating mosaic strips perfectly complements both modern as well as traditional décor. And, thanks to special design, this mosaic offers a seamless and neat finish upon installation. Despite being affordable, the Glass Mosaica Olive Green Marble Mix offers all the qualities of a superior tile. It exhibits top notch manufacturing and is built to last. It will not lose its looks or surface finish, even many years after installation. For glamourous mosaic tiles in Perth, look no further than the Glass Mosaica Olive Green Marble Mix tile at Ross’s Discount Home Centre. Buy this mosaic at an unbelievable bargain from our online store today!